This is another one of those products that emphasizes and reiterates the EdgeStar promise of creating appliances which effortlessly fit into the consumer’s lifestyle. In this particular case this is almost too perfect a wine cooler for the discerning wine enthusiast who has a steadily growing collection and wants to store up to 18 of their bottles at perfect chilling temperatures. 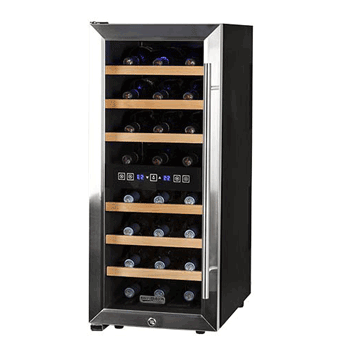 In this EdgeStar Built-In 18 Bottle Wine Cooler review, we explore the features, functions and design relevance of a wine cooler with one of the widest temperature ranges available. Read on to find out exactly why this is such a popular choice in wine coolers among the most meticulous of wine enthusiasts. While the manufacturers (EdgeStar) of this 18-bottle cooler are ordinarily associated with ultra-modern and contemporary designs, with this particular cooler they struck a fine balance between classic timelessness and progressive modernity. In other words, this is a wine cooler that would be as much at home in a setting such as a classic-themed arcade (or man-cave) as it would be in an ultra-modern, contemporary or minimalist interior space. This versatility in design was achieved by a streamlined glass door with stainless steel trimming, classic wooden slide-out shelves and a beautiful LED interior light. The door’s glass is further enhanced by a dot-matrix protective cover (integrated), which has as much functionality implications as it does visual appeal. Above all else, this cooler’s 12” profile renders it a perfect fit for any space, adding oodles of class and elegance to any space you’d want to put it in. Measuring out at a volume of 34.25” (H) x 11.6” (W) x 22.6” (D) and weighing in at 66 lbs, this 18 bottle wine cooler features a single cooling zone with a very wide temperature range (perhaps the widest single zone temperature range we’ve come across). Five deep wire shelves trimmed with wood elegantly house the standard 750ml bottles along with one shelf of partial depth. All of the shelves slide out a few inches and the interior is illuminated by a soft Interior LED light. The fanned hot air vents are front-facing, which makes this a truly good fit for even the smallest of cabinet spaces. Integrated carbon filters maintain the integrity of stored wines by naturally protecting them from odor contamination, while the tinted glass on the door filters out potentially harmful light rays. This cooler comes with a one year parts-and-labor warranty. 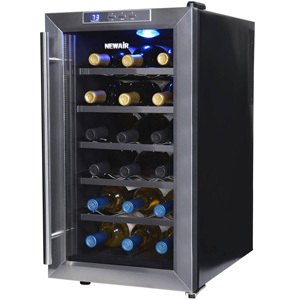 In addition to the ability to store up to 18 bottles, this wine cooler is a wine enthusiast’s interior design dream. Not only is it conveniently slim and compact, but it also features a reversible door which means you can literally install it anywhere you see fit. Truth be told though, the 18 bottles are a real tight fit, especially if you have a few larger bottles to jam in. You’ll have to be very careful when trying to pull some bottles out if the cooler is fully packed. This cooler delivers on everything expected of a compression-cooled unit, with its cooling power outputting what we can comfortably claim to be the widest temperature range we’ve come across. The pleasantly broad range of 40 to 65 degrees Fahrenheit makes it the perfect cooler for all wine varieties and types. The internal temperature is easily observed and controlled with the digital display/control unit and you get even cooling as a result of the powerful (but silent) internal air circulation fans. All of this power and range in practice simply means you can either store all your wines at a safe temperature of around 53 degrees, or you can set the temperature to store one of your wine types/varieties at its optimal decanting temperature, ready for serving. We suggest 53 degrees because while this is indeed a compression-based cooler, the temperature does tend to fluctuate a bit, by between 2-3 degrees. You would ideally not want your whites getting exposed to temperatures higher than 56 because of these slight fluctuations. This wine cooler will make for a great addition to any kitchen, home bar, man-cave, or any other space you’ve nominated for a wine cooler. This 18-bottle cooler stays true to the EdgeStar doctrine of designing appliances that are compact but still offer a lot by way of features and capacity. When one takes into account the fact that this cooler was designed to fit into a limited space, you cannot help but marvel at just how well it was designed. You might have to look the other way when completing the payment for this cooler, but you get every bit of value for every dollar spent. You get a lot of practical and tangible quality with this cooler and you definitely won’t regret the purchase, if you do indeed buy it. 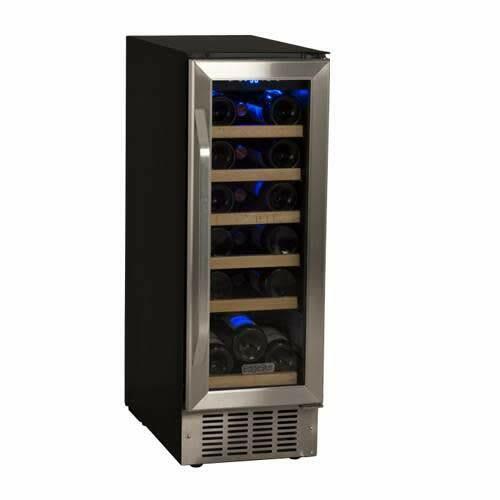 We’re pretty confident that after reading this detailed EdgeStar Built-in Bottle Wine Cooler review your mind will be opened up to yet another one of the premier options available to you.